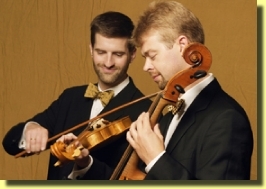 Since its creation in 1996 by violinist Jonathan Talbott and cellist Tormod Dalen, Ensemble Braccio has won wide critical acclaim for its performances and recordings. 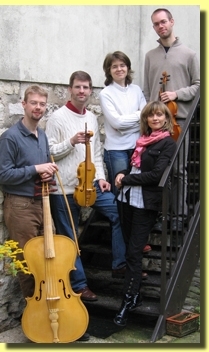 Braccio brings the ravishing and passionate music of renaissance and early baroque violin ensembles back to life. The name of the group is taken from the original name for the violin: viola da braccio. Praised for its “fresh and lively music making,” its “illuminating and memorable” concerts, and its “intimate and communicative playing,” Braccio plays on instruments designed and made for them after detailed study of pictures and playing styles of the time. The ensemble members' continuing research into early instruments, repertoire and improvisation has led to concerts and recordings which redefine the sound of early stringed instruments and bring the rich and lively early violin repertoire to modern audiences. Recordings of Ensemble Braccio can be heard on the Aliud label and as part of the permanent exhibition of the Vleeshuis Museum in Antwerp. The studio photos on this site are copyright Joris Jan Bos, 2004. Site copyright Ensemble Braccio, 2007.